We are back home now but I'm still playing catch up with highlights from our trip. We went to Disneyland and California Adventures last weekend and had a blast. It was crowded...and the girls were pretty tired from all of our travels but we had a good time. We started out at Small World. That's always where we go first. I don't know why. Maybe because it's nice to sit in a boat for 10 minutes after you walk 5 miles to get into Disneyland. We found out something very quickly when we got in line. Julianne does not like to wait in line. For anything. I kept explaining that we had to wait our turn to which she responded "it's Julianne's turn" every 5 seconds. Good times! Claire didn't seem to mind the waiting. She doesn't mind anything if she is being held. This kid LOVES to be held. Julianne sat on my dad's lap for about 5 seconds before she wanted to sit in the seat because "I big girl". She wanted her own seat on every single ride. Sometimes she preferred to stand because she couldn't see so well sitting in the seat even though "I big girl"
This is the most relaxed I have seen Claire in a while. She is usually moving all about but on the rides we took her on she just sat and stared. I mean, if this isn't relaxed, I don't know what is. Julianne got bored when we were waiting to get off the boat. She took the opportunity to take a little rest. She was tired already and we had only rode 1 thing. 2 weeks of travelling was catching up with her. When we got off Small World she immediately said "wanna ride horsey". We weren't even near the carousel and hadn't been by it yet. My mom thinks she remembered from the last time we were there. She had just turned 1. I said "no way". I don't know....the kids mind is a steel trap, she doesn't forget anything. Well, she forgets to tell me that she needs to poop until after she does it but that's another post. She loves horses. She was a happy girl once she was on the horse. Then she makes a deep thoughts face like this one. I would love to know what's going on in that little mind. We went to wait in line for Dumbo which was the longest line we waited in all day. 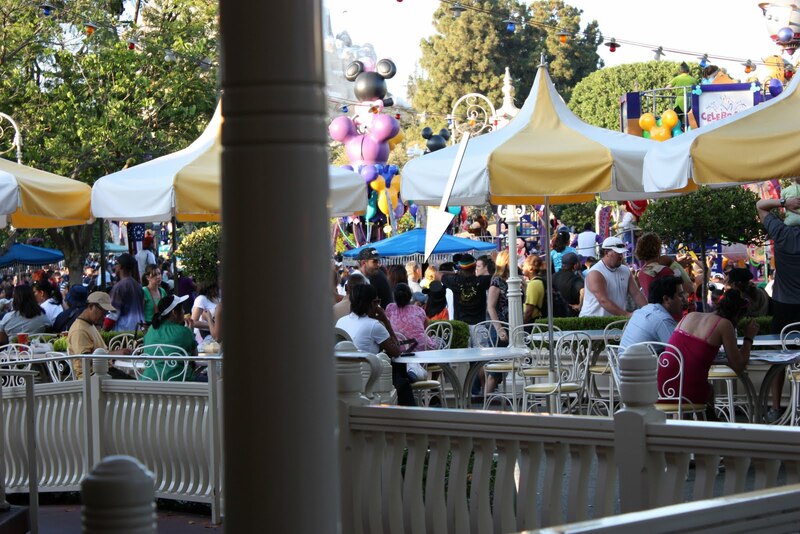 Dear people in line for Dumbo that don't have kids, please go ride the rockets instead. K-Thx! Seriously, half the people in line for this ride were full grown adults with no kids with them. Really? Julianne was not very patient in this line. I was thanking God when we got our feather which meant we were next. Mimi got in the elephant in front of ours so she could take pictures. See the big girl sitting in the seat. I swear she couldn't see anything but wanted nothing to do with sitting on my lap. This is what Claire looked like through the entire ride. She has big eyes to start with but they were out of control on the Pooh ride! She was still wide-eyed when we got outside. And so happy. She is the happiest baby. My dad took Julianne down to get a better view of the parade (which was awesome) while I rested for a bit and fed Claire. Can you find Julianne? It's like where's Waldo? Except I added an arrow for you. I asked my mom to get a picture of me and both my girls. Attempt #1 - FAIL. Julianne was trying to show me something. I'm talking. Claire is covered up by Julianne's arm. Try #3 - FAIL. Now I'm not looking at the camera and Julianne still really wants me to see what she is pointing at. Try #4 - FAIL. I still don't know what she was pointing at. FAIL. Both kids crying now. So much for that idea. We went back to Small World. Claire was sleeping so my mom stayed with her and my dad, Julianne and I went again. Julianne was getting so sleepy. We were trying to make it until the fireworks show but I was fairly certain she wasn't going to make it. Are those tired eyes or what? We went back to the carousel. We were all pretty beat. Claire liked the lights though. We called it a night and started heading for the main gate. We decided to go into a store to get the girls a souvenir and by the time we did that, the fireworks started. My dad took Julianne out to watch them while my mom and I checked out. We got outside and the fireworks were so loud, it scared Claire and she began to wail. I made a b-line for the exit and my dad stayed with Julianne to watch the fireworks. About 5 minutes before it was over she said "wanna go". That's how tired she was. Of course when we got to the hotel she got her second wind and was bouncing off the walls. We all settled in for a good night's sleep and got ready for day 2. Julianne wasn't quite sure what to think about it. Then we headed for Playhouse Disney Live. This was by far her favorite thing of the day. I'm hoping they have a live show come here that I can take her to. I wasn't sure if a live show would keep her attention but it did. She loved it! Bubbles came down from the ceiling and it made her so happy. Bubbles are probably her #1 favorite thing right now. We headed outside in search of characters. We found goofy! These were fish instead of horses but she liked it! She also loved the fountain. I'm pretty sure she would have stayed and played in that water all day. But still got her picture taken with Pluto! 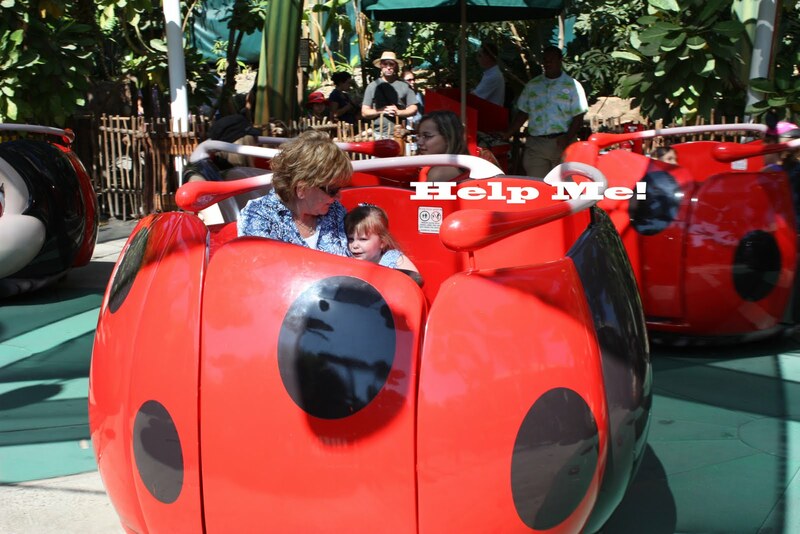 My mom talked Julianne into going on the "ladybug ride" which were teacups that went really fast. She seemed excited before it started. Then seemed a bit unsure as the ladybugs started to move. She didn't seem to like it much when they started going really fast. like this one...some sort of hand puppets or something. We went inside for a little time with Crush the turtle from Nemo on the big screen. We had to wait. Julianne was peeved about the waiting once again. Our last stop of the day was the Alladin show. It was so good. It was a full on broadway production style. Claire loved it so much she passed out about 10 minutes in. Julianne did love it but even so, finally gave it up about 30 minutes in. It was so loud in the theatre...I can't believe they both slept through it. Julianne was so tired that she continued to sleep the whole walk out. This is unheard of for this child. I can't even take her out of her car seat without her waking up. I've never been able to transfer her anywhere while she is asleep, not even when she was a tiny babe. She even made it into the stroller and was still asleep. They both were. They both woke up to shop though (they are their mother's daughter's)! I wanted to get Julianne Mickey ears but she wouldn't keep them on for even a second. We settled for a stuffed minnie mouse for Claire and a Minnie that lights up and has a spinning skirt for Julianne. They were both happy and we headed back home to my parents house. After we arrived 3 hours later, this is what Claire looked like. And if you haven't figured it out from all the posts about our trip, my parents are all kinds of awesome. They are such wonderful grandparents and I'm so happy that our girls are making these memories with them. It's not always easy for them (they both still work) but they take time off and make it happen and we love them for it! how fun! we loved small world. and yes, dumbo was the world's longest line for us too. what the heck? and I think Claire's eyes were wide as saucers on the Pooh ride because it's so phsycodelic. seriously the creators of that ride must have been on crack! So much fun! We live nearby so we have passes, but we let them expire for the summer. Too hot and crowded. Playhouse disney is my girls' favorite, a lot of fun! I am glad you guys had a great time! That was nice of your parents to help out! Awww. You made me cry. We love spending time with you and your girls and wouldn't miss one single opportunity to do so. These are memories that dad and I will cherish for the rest of our lives. What a fabulous trip! I'm so jealous :) The girls look so happy. I'm glad that you had a great time. Wonderful pictures too.